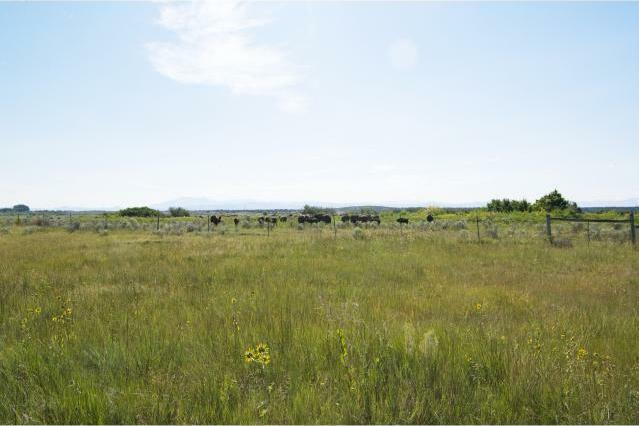 When HBC Chief Trader Richard arrived at Fort Hall in the 1840s, there were millions of buffalo; this landscape would have been a breathing brown carpet. This day, seeing even this small herd of these massive, magnificent beasts in its natural habitat was an incredibly breathtaking experience. Ghost Road. So named for the old woman seen walking the road. As drivers slow to offer her a ride, she disappears. As we approached our turnoff, off to the right, a magnificent chestnut horse raised its head. In what seemed recognition, and without hesitation, it started galloping towards us. The horse waited for us in the middle of the road at the turnoff, turned when we arrived and led us a long distance down that road before returning to the grasses. Perhaps there was a different ghost with us this day; maybe Richard or Johnny Grant welcoming us home. During the time Richard Grant was Chief Trader of Fort Hall, the British flag, with the initials HBC woven on it, flew over the fort. Recipient of the Certificate of Appreciation awarded by the Mayor of Pocatello. 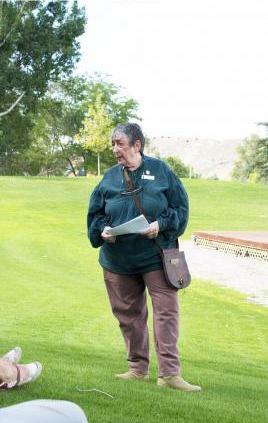 Tour guide Extraordinaire for our Idaho Grant Reunion. 7506 Uncle Mike? Uncle Peter? Richard Grant, our first Canadian ancestor, was born in Montreal; never set eyes on Scotland. Had his father, William Grant of Troi-Rivieres, though, gazed upon these thistles and waters, would he have been reminded of his distant home? 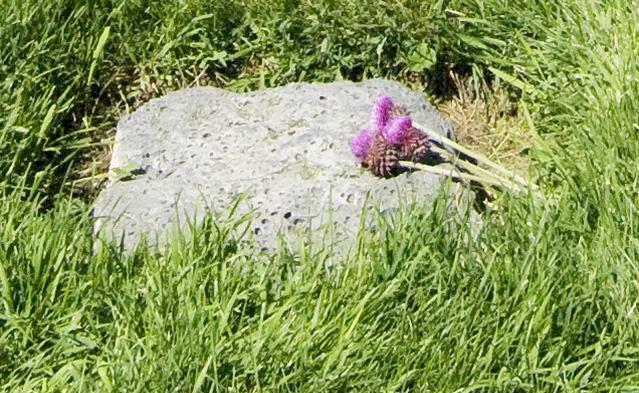 A bouquet of thes thistles & grass, bundled in a braided ribbon of red aran wool, was a fitting sentiment for the graveside ceremony of Richard Stanislas Grant. Grants on The Bottoms ~ The site of the original Fort Hall is generally referred to as 'The Bottoms'. 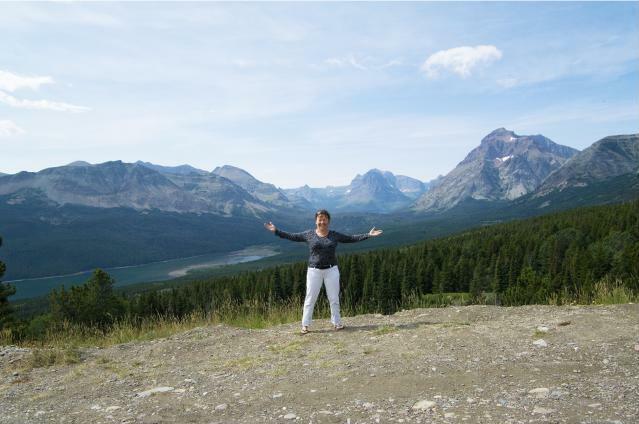 It is a sheltered area in the bend of the Snake River near the junction of the Blackfoot and the Portneuf Rivers. 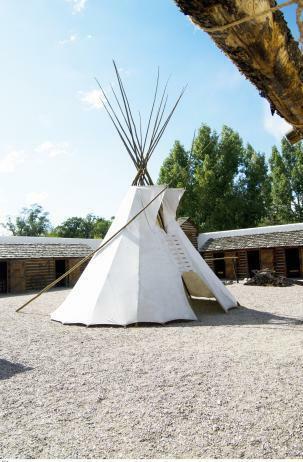 Plentiful in fish and game, it was long used as a gathering and camping place by Shoshone and Bannock Indians. This was our first attempt to find the marker at the exact site of the fort. Our search was unsuccessful, but we had a great time looking. Unbelievably beautiful area! Rooms 1 & 2 were each approximately 15 x 17 feet. Fort Hall Replica courtyard. The stairs lead to three rooms on the second floor. 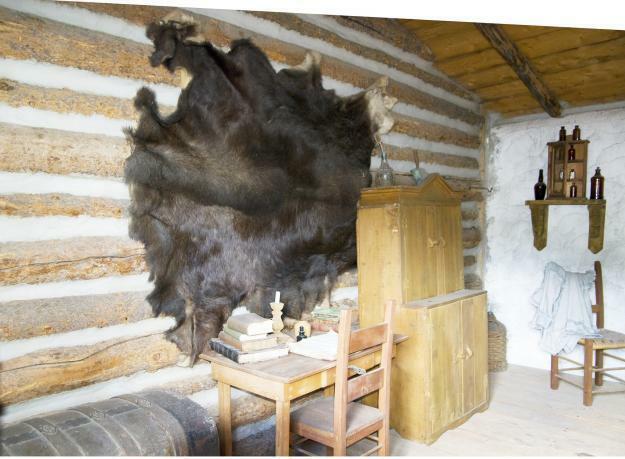 In the original fort, two small rooms would have served as living quarters for Chief Trader Richard Greant and his family. One large room would have been available for their use when not needed by the HBC for other purposes. 7520 Fort Hall Courtyard - L: Office; Centre Back: Blacksmith Shop. 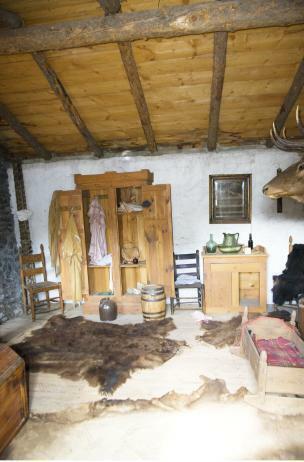 Second room of Chief Trader Richard Grant's living quarters. (Right) When his sons rejoined Richard on August 3, 1847, the family would have included Richard and his 2nd wife, Helene; Helene's daughter from her first marriage, Jemima Kittson; Richard's sons from his second marriage, James Cuthbert Grant; Richard & Helene's daughters, Helene, Julia and Adelina Grant; Richard's sons from his first marriage, John Francis and Richard Stanislas Grant with his pregnant wife, Emilie. Joseph Richard Grant was born only one month later, on September 7. Sheep Rock aka Sheep Mountain on the Oregon Trail. It was at this point imigrants had to decide which trails they would take to their destination. Ellen Carney giving a history lesson to Mark Cameron, Marilyn Grant Cameron and Peter Grant. Jeff Anderson is Fairview Cemetery's sexsmith. My correspondence with Jeff began about twenty years ago. 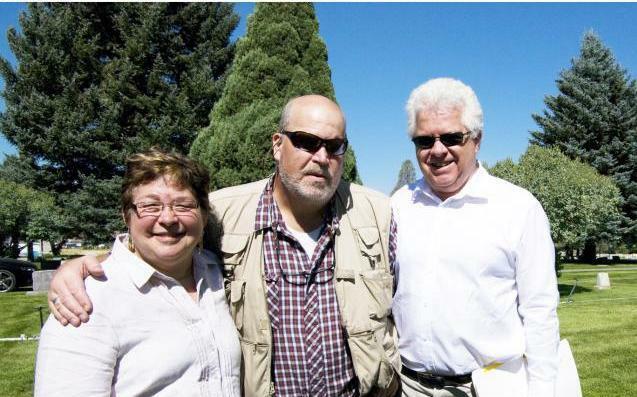 His identification of the "lava rock marker' provided validation of the family story relating to the death and burial of our ancestor, Richard Stanislas Grant. Meeting Jeff was a surprise and an honour and definitely a highlight of the reunion! Soda Springs geyser. The geyser is timed to blast at least 100 feet in the air every hour. Its mean temperature is seventy degrees fahrenheit. 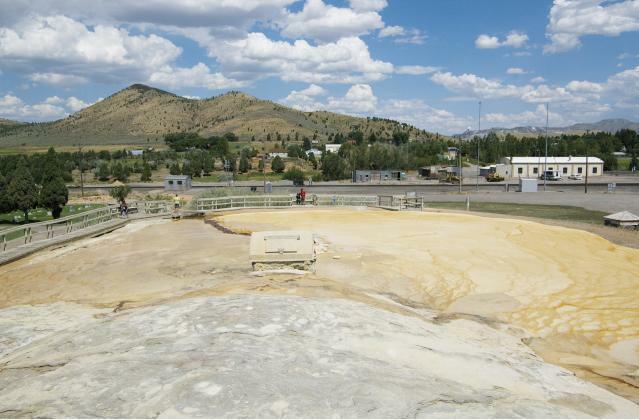 Soda Springs geyser - 76 years of the geyser's mineral deposits - looks like something escaped from a sci-fi lab! 7565 Ellen Carney, B.A., M.A. Teacher, Caribou County Historic Preservation Commissioner (3 terms), newspaper correspondent, award winning author, tour guide extaordinaire. This is an east-west travel corridor of the earliest emigrant trails that continued even after the arrival of railroads and highways. Early explorers such as John Fremont, Jedediah Smith, Osborne Russell, and missionary Narcissa Whitman were among the first to describe this route. 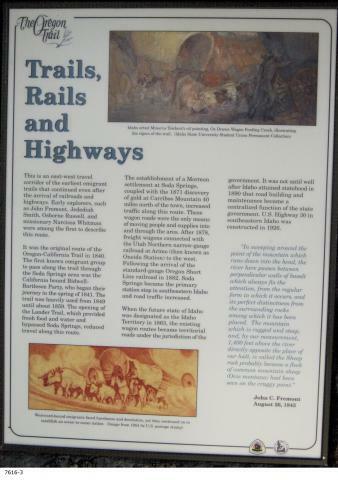 It was the original route of the Oregon-Claifornia Trail in 1840. 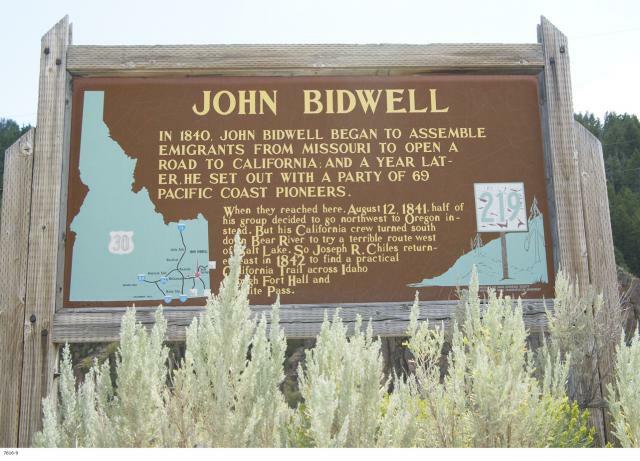 The first known emigrant group to pass along the trail though the Soda Springs area was the California bound Bidwell-Bartleson Party, who began their journey in the spring of 1841. The trail was heavily used from 1849 until about 1859. 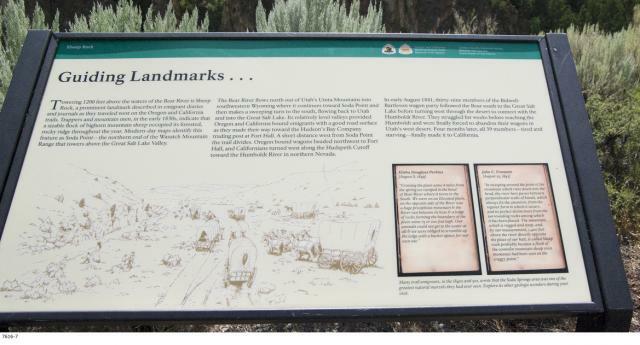 The opening of the Lander Trail, which provided fresh food and water and bypassed Soda Springs, reduced travel along this route. 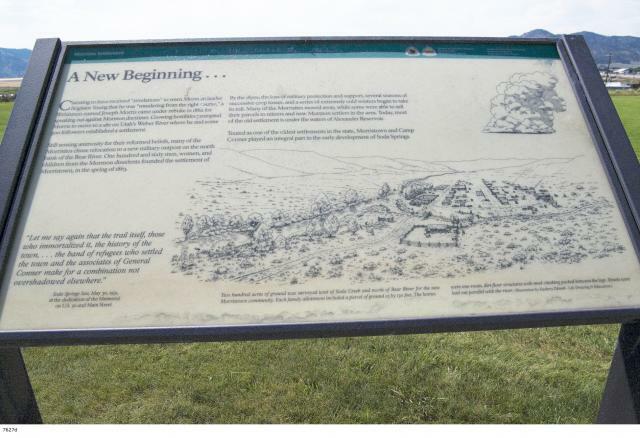 The establishment of a Mormon settlement at Soda Springs, coupled with the 1871 discovery of gold at Carriboo Mountain 40 miles north of the town, increased traffic along this route. These wagon roads were the only means of moving people and supplies into and through the area. After 187, freight wagons connected with the Utah Northern narrow-guage railroad at Arimo (then known as Oneida Station) to the west. Following the arival of the standard-gauge Oregon Short Line railroad in 1882, Soda Springs became the primary station stop in southeastern Idaho and road traffic increased. 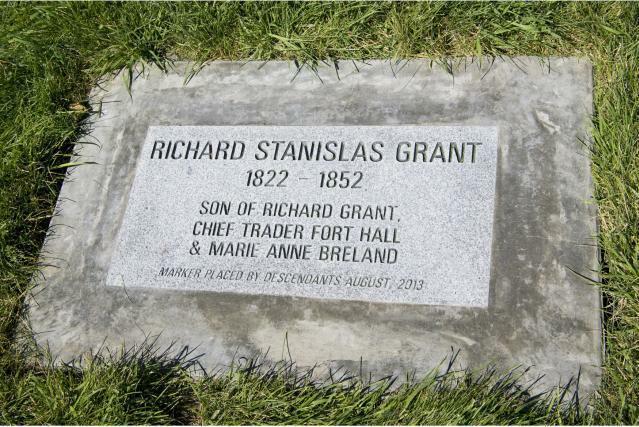 When Richard Stanislaus died in 1852, he was buried at Steamboat Spring on the Bear River. On July 2, 1924, flooding resulting from the construction of the Alexander Dam on the Bear River necessitated reburial at higher ground. 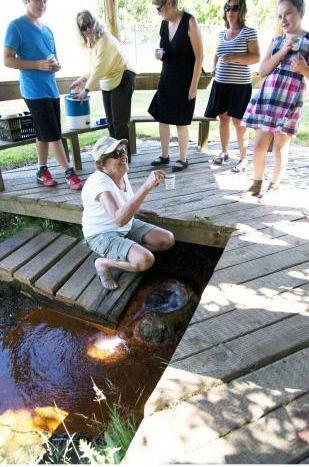 According to the family story, "friends moved him and marked his new grave with a large lava rock". No one any longer remembers who those friends were, but because they took the time and care to smooth the sides and corners into approximately a 14 inch square block, and place it here, we were able to find and identify the grave 75 years after the reburial. Had Richard remained at his original location, his grave would have been under water. 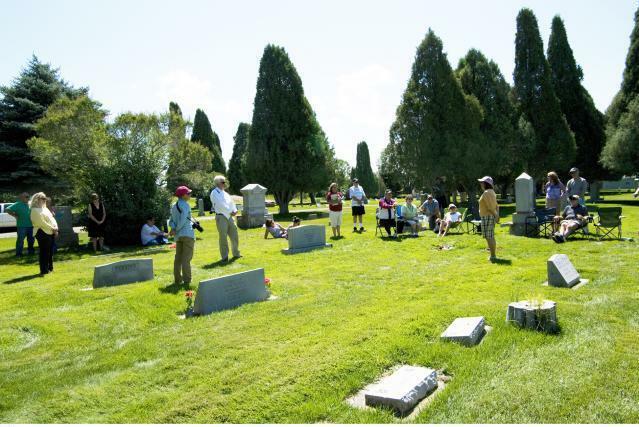 Interestingly, there were two other graves relocated at the same time. One record indicates the two other persons rest here with Richard. The Scottish Thistle symbolizes bravery, courage, loyalty, endurance and fortitude - in short - "Stand Fast, Craig Elachie!" These thistles come from "The Bottoms", the area of the original Fort Hall, which was managed by Richard Stanisas' father. 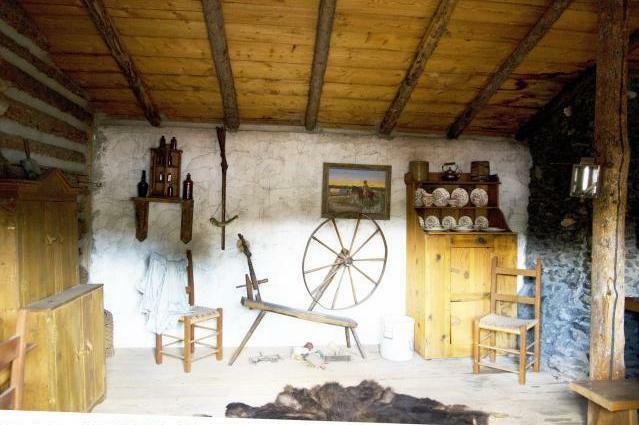 This single room is about three times the size of either of Richard Grant's living quarters. 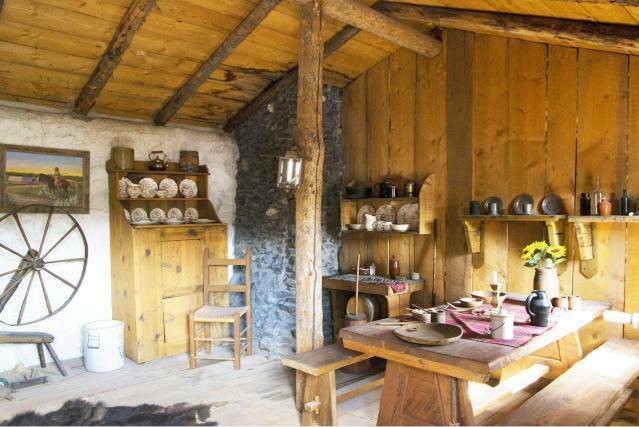 When not needed by the HBC for other purposes, it was used a part of Grant's living quarters. 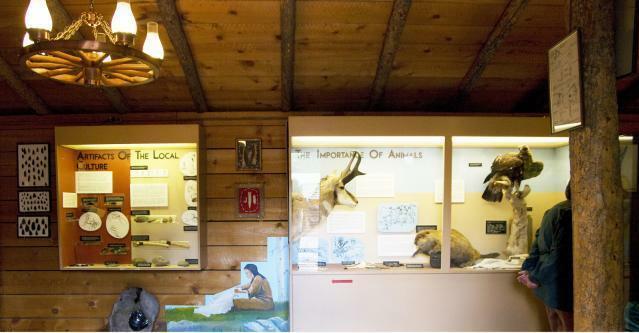 Today, it is a museum depicting Native American culture of the fur trade period. 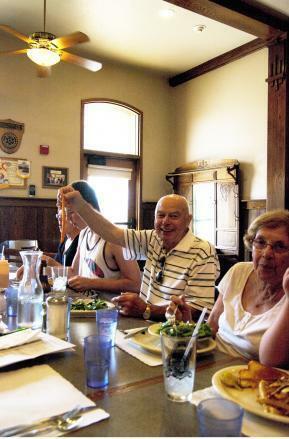 Lunch in Soda Springs was the popular Enders Hotel & Museum. 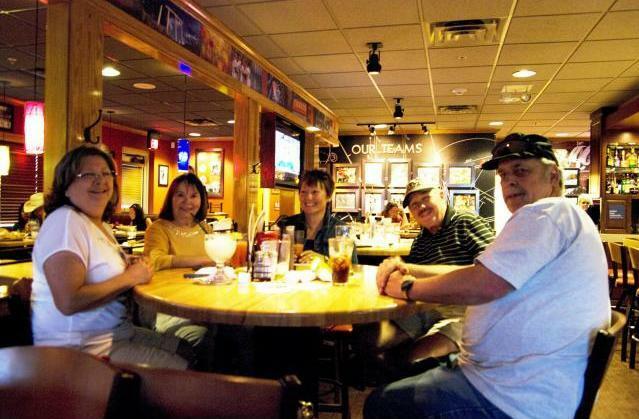 Dining amidst antiques ranging from furniture to Hollywood memorabelia...atmosphere...super food and great service. Here, Jim Cameron shows off his genuine Idaho French fry. WOW! 5 potatoes to a 10 pound bag?! In 1937, a man drilling for water ruptured an underground chamber. The resulting geyser sprayed continuously, so was capped and controled to prevent the source from being exhausted. 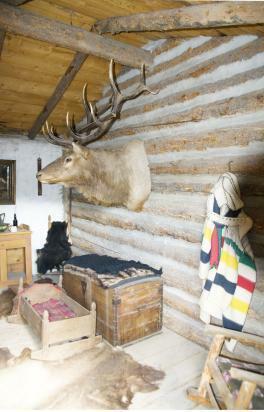 Grant's spare living quarters - when not needed by HBC for other purposes. Sunday, August 11, 2013. Midnight goodbyes ~ Skip & Kathryn Brolliar and Sally Grant (centre). Sally Grant Our Grant Reunion Was This Great!!! Marilyn Cameron ~ Going for the brew. L-R: Anita Grant Steele with special guests, Raymond LaVatta, Howard and Geraldine Doore, Elizabeth LaVatta. Anita and Raymond are related through the marriage of Laura Delores LaVatta and Joseph Richard Grant (Son of richard Stanislas Grant). Howard is our most recent MacRobbie Grant find. He is a descendant of James Cuthbert Grant, son of HBC Chief Trader Richard Grant and his second wife, Sarah aka Indian Woman at Oxford House. 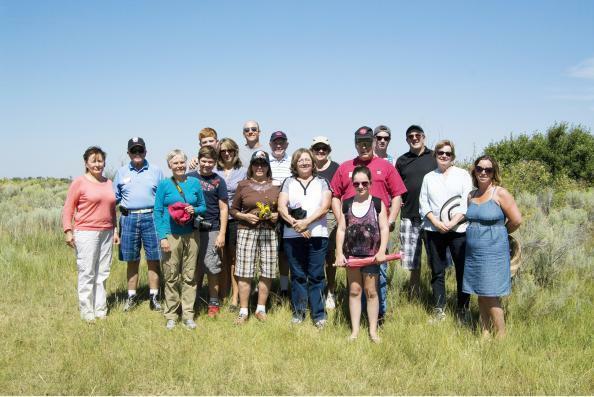 L-R: Sally Grant (Alberta), Kathy Brolliar (Oregon), Anita Grant Steele (Yukon), Raymond LaVatta (Pocatello, Idaho), Marilyn Grant Cameron (British Columbia), Mike Grant (British Comumbia), Betty Grant Baier (British Columbia), Howard Doore (Pocatello, Idaho), Peter Grant (British Columbia). 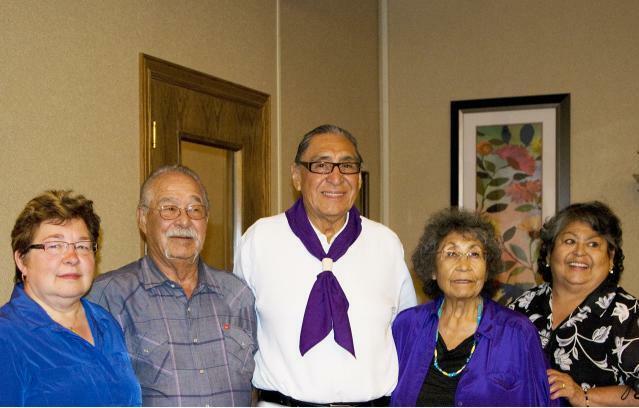 All are descendants of HBC Chief Trader Richard Grant and Marie Anne Breland, excepting Raymond LaVatta (4th from left) and Howard Doore (2nd from right). Raymond is related to Anita through Joseph Richard Grant & Laura Delores LaVatta; Howard is a descendant of James Cuthbert Grant, son of Chief Trader Richard Grant and his second wife, Sarah aka Indian Woman at Oxford House, Manitoba. This is a first meeting with Howard. Lava eruptions west of Sheep Rock at least 140,000years ago blocked the Bear River from draining into the Snake River system. Instead, the Bear was forced to drain into what was the Lakes Thatcher and Bonneville to the south. The Bear River's course forms a giant horseshoe shape between its source in the high Unita Mountains of eastern Utah and where it enters the Great Salt Lake northwest of Ogden. This high, rocky, abrupt termination of the mountain, a prominent Oregon Trail landmark, is the northern terminus of the Bear River Range, which is continuous with the Wasatch Mountains. The Bear River flows around the base of the mountain before turning south. Just west of Sheep Rock is Alexander Crater, a basaltic cinder cone less than 20,000 years old that was mentioned in several Oregon Trail diaries. John C. Fremont, in 1843, described Alexander Crater as a "a Very perfect crater.." He noted the walls "were Perfectly vertical and disposed like masonry in a very regular manner..." In recent years the crater has been mined for gravel and landscaping materials. Nearby Alexander Dam was built on the Bear River in 1923, forming Alexander Reservoir. 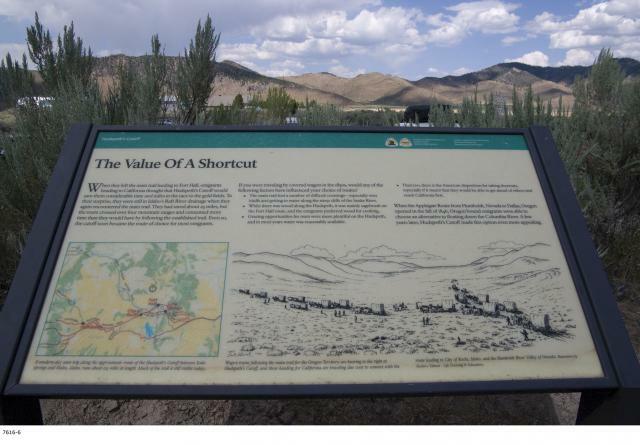 When the future state of Idaho was designated as the Idaho Territory in 1863, the existing wagon routes became territorial roads under the jurisdiction of the government. 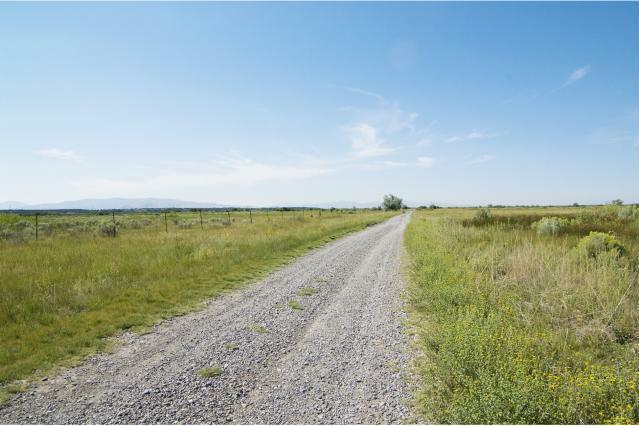 It was not until well after Idaho attained statehod in 1890 that road building and maintenance became a centralized function of the state government. 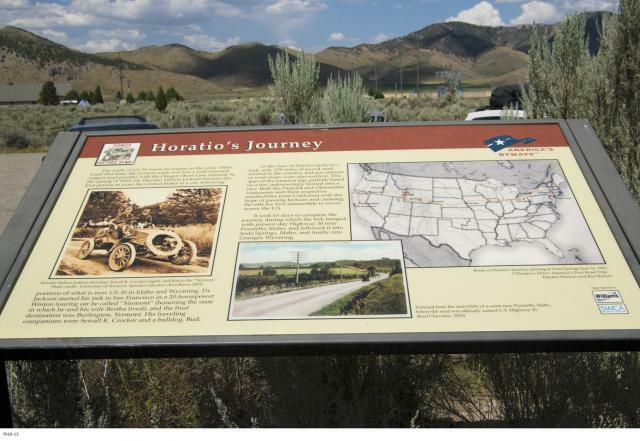 U.S. Highway 30 in southeastern Idaho was constructed in 1926. "In sweeping around, the point of the mountain which runs down into the bend, the river here passes between perpendicular walls of basalt which always fix the attention, from the regular form in which it occurs, and its perfect distinctness from the surrounding rocks among which it has been placed. The mountain which is ruggd and steep, and, by our measurement, 1,400 feet above the river directly oposite the place of our halt is called the Sheep rock probably because a flock of common mountain sheep (Ovis Montana) had been seen on the craggy point." < Sketch of Fort Hall by William Tappan in 1849 depicts adobe outer wall and blockhouse fortifications. Lithograph by E. Weber & Co.
For over two decades (1834-1856) fur trappers and Oregon Trail wagon trains passed by the doors of this adobe fort. 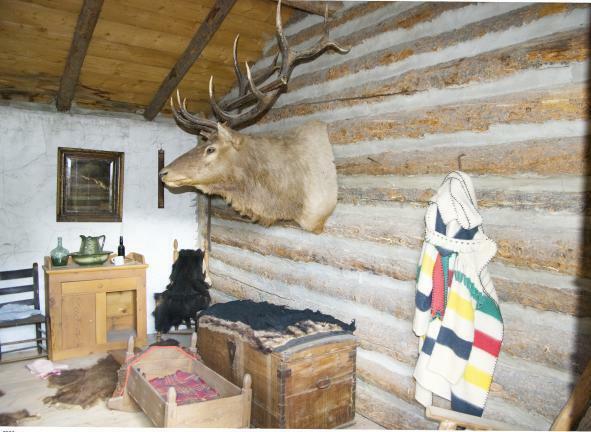 Nathanial Wyeth, an ambitious Bostonian, built the post in 1834 but soon sold his holdings to the Hudson's Bay Company, whose staff took over in 1838. 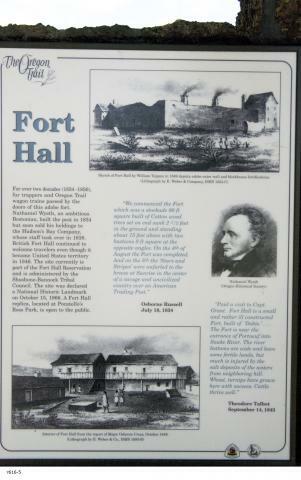 British Fort Hall continued to welcome travelers even though it became United States territory in 1846. 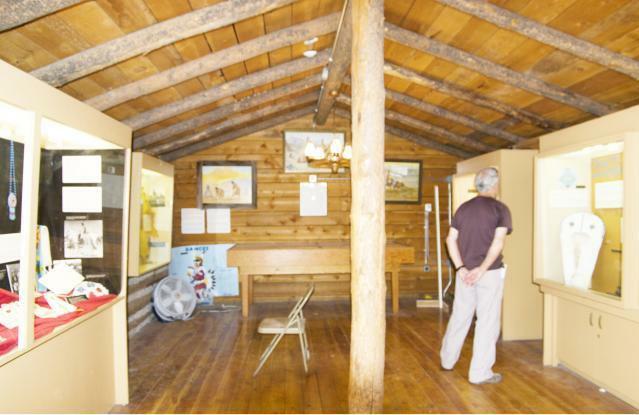 The site currently is part of the Fort Hall Reservation and is administered by the Shoshone-Bannock Tribal Council. 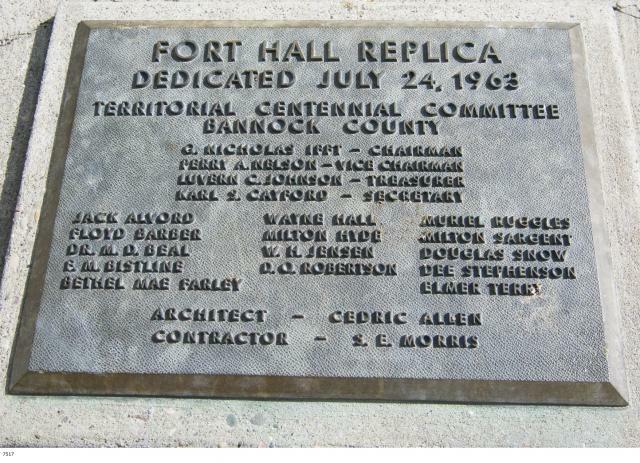 The site was declared a National Historic Landmark on October 15, 1966. 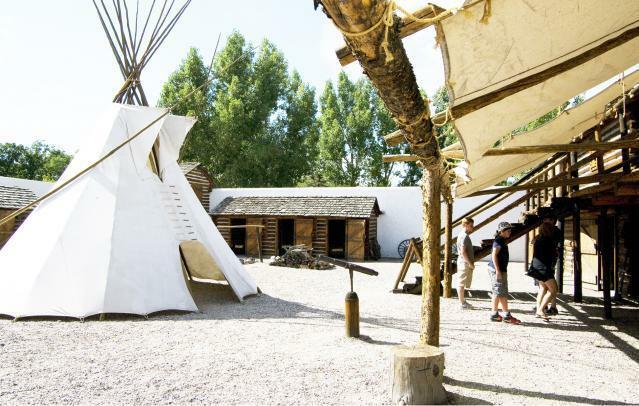 A Fort Hall replica, located at Pocatello's Ross Park, is open to the public. < Interior of Fort Hall from the report of Major Osborne Cross, October 1849. Lithograph by E. Weber & Co.
"We commenced the fort which was a stockade 80 ft square built of Cotton wood trees set on end sunk 2 1/2 feet in the ground and standing about 15 feet above with two bastions 8 ft square at the opposite angles. On the 4th of August the Fort was completed. And on the 5th the 'Stars and Stripes' were unfurled to the breeze at Sunrise in the center of a savage and uncivilized country over an American Trading Post." "Paid a visit to Capt. Grant. Fort Hall is a small and rather ill constructed Fort, build of 'Dobie'...The Fort is near the entrance of Portneuf into Snake River. The river bottoms are wide and have some fertile lands, but much is injured by the salt deposits of the waters from neighboring hill. Wheat, turnips have grown here with success. Cattle thrive well." 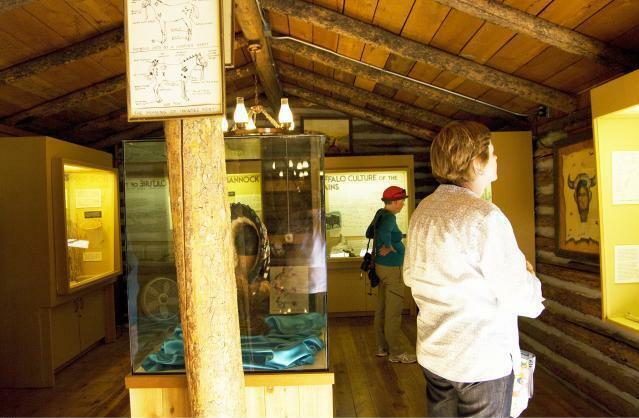 Native Americans traveled and camped in the Sods Springs area for centuries before emigrants traveled the Oregon Trail. Sheep Rock (Soda Point) marked the junction of the main route of the Oregon-California Trail and the Hudspeth Cutoff diverged 3/4 mile west of here, striking west across the lava-covered valley. 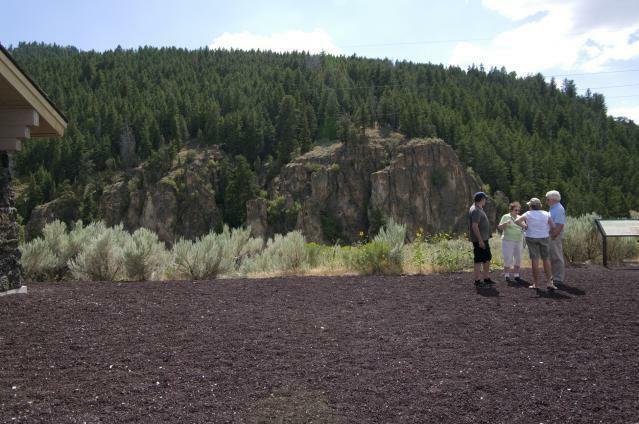 Its route passed over Fish Creek divide and the Portneuf Range south of Lava Hot Springs. Its western terminus was at the City of Rocks, where it rejoined the California Trail. From Sheep Rock, the main branch of the Oregon-CaliforniaTrail headed northwest towart Fort Hall. On July 19, 1849, Benoni Morgan Hudspeth, captain of a wagon train with about 70 wagons and 250 people, led his group west along what was to become the Hudspeth Cutoff for California. With John Myers as guide, they opened a new wagon route to California shortening th northern and more established route north to Fort Hall. Hudspeth and Myers had scouted the area prior to crossing. 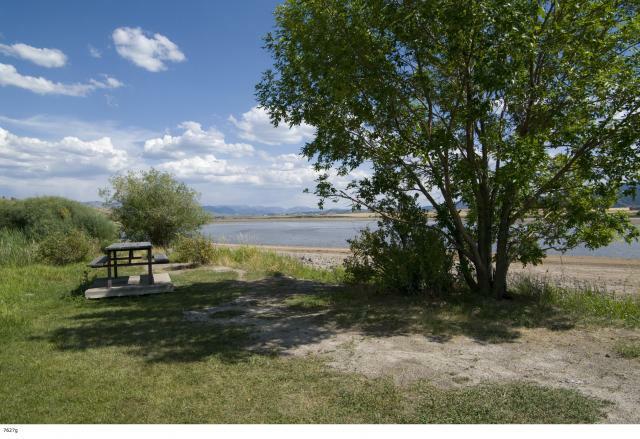 Hudspeth was familiar with the area since he had been with John C. Fremont on his 1843 expedition to the Great Salt Lake area. Departing from the established road, they proceeded almost due west over the mountains rather than around them. 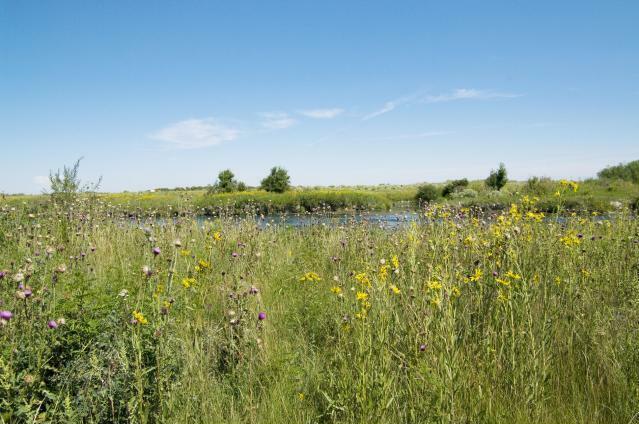 This new 132-mile route joined the California Trail to the west on the Raft River. Spurred by the Gold Rush of 1849, afterward most California-bound traffic went over the cutoff due to the abundance of rorage for their animals. "Four miles from Steamboat Springs we came to old crater Alexander Crater and the junction of the Fort Hall road and Hudspeth's Cutoff. At this point, Bear River which has run nearly north for 150 miles or more, bends, short round the mountain and runs back nearly parallel with its former course. The fort Hall road runs to the right and runs along under the bluff, and Hudspeth's Cutoff continues nearly straight ahead towards the opposite mountains." valley, or the right hand road to Fort Hall. Westward-bound emigrants entered Idaho after crossing Thomas Fork Valley. They soon encountered the climb and descent of Big Hill, witnessed nature's curiosities at Soda Springs, and discovered willing traders at Fort Hall. 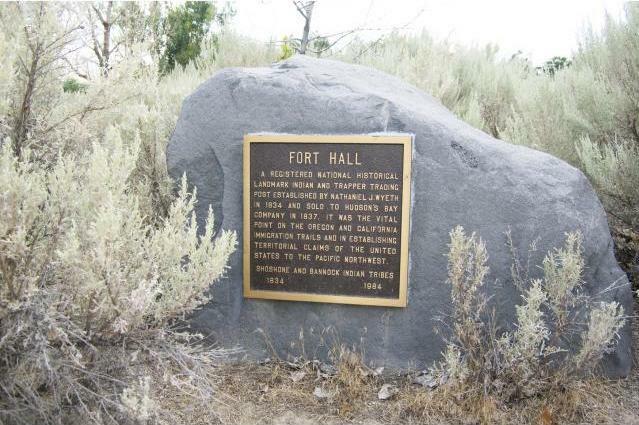 In 1843 wagons first rolled past Fort Hall to face the harshness and desolation of the Snake River Plain. Dust, sagebrush, lava rock, mosquitoes, a burning sun, cold nights, and a concerned Native American population made the journey an arduous one. Yet, these pioneers continued on and helped to establish an ocean-to-ocean nation. Prior to the discovery of gold, California-bound emigrants followed the main Oregon Trail to Raft River before turning south on the California Trail. Gold seekers soon opened new routes in an attempt to reach their destinations sooner. 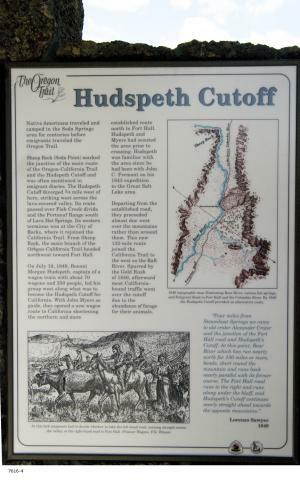 Hudspeth's Cutoff (1849) directed traffic west from Soda Springs. The Salt Lake Alternate (Hensley's Cutoff, 1848) enabled travelers to obtain supplies in Salt Lake City before continuing their journey. These routes joined in the Citty of Rocks area and headed west through Granite Pass. As their numbers increased, lands along the trail became barren of grass and wood, and water sources often became tainted. Consequently, alternate routes were explored and utilized. 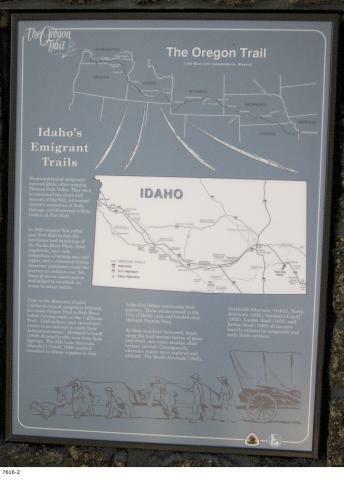 The South Alternate (1843), Northside Alternate (1840s), North Alternate (1850), Goodale's Cutoff (1852), Lander Road (1858), and Kelton Road, (1869), all became heavily utilized by emigrants and early Idaho settlers. When they left the main trail leading to Fort Hall, emigrants heacing to California thought that Hudspeth's Cutoff would save them considerable time and miles in the race to the gold fields. 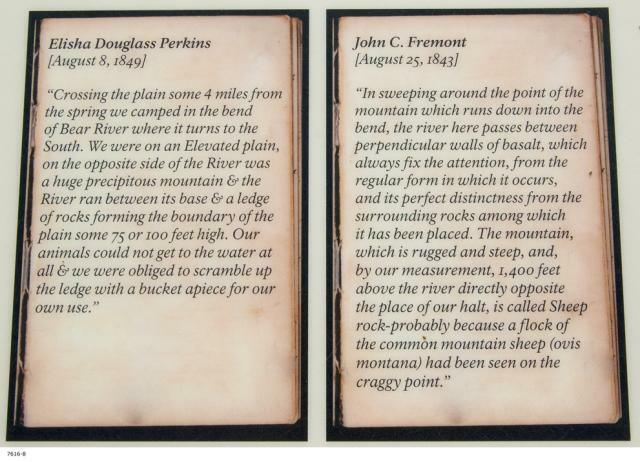 To their surprise, they were still in Idaho's Raft River drainage when they again encountered the main trail. 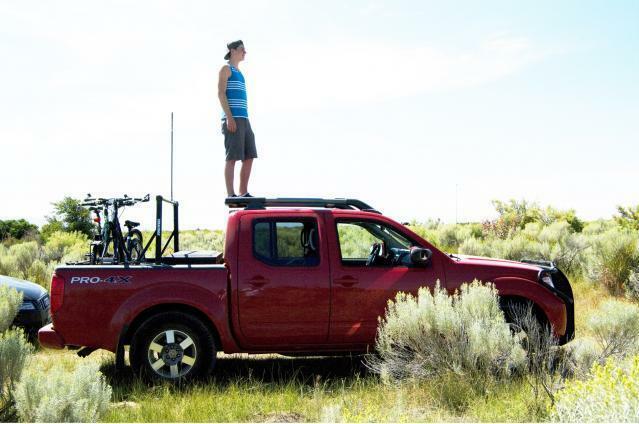 They had saved about 25 miles, but the route crossed over four mountain ranges and consumed more time than they would have by following the established trail. Even so, the cutoff soon became the route of choice for most emigrants. The main trail had a number of difficult crossings-especially over bluffs and getting to water along the steep cliffs of the Snake River. While there was wood along the Hudspeth, it was mainly sagebrush on the Fort Hall route, and the emigrants preferred wood for cooking. Grazing opportunities for oxen were more plentiful on the Hudspeth, and in most years water was reasonably available. Then, there is the American disposition for taking shortcuts, especially if it means that they would be able to get ahead of others and reach California first. When the Applegate Route from Humboldt, Nevada to Dallas, Oregon opened in the fall of 1846, Oregon bound emigrants were able to choose an alternative to floating down the Columbia River. A few years later, Hudspeth's Cutoff made this option even more appealing. The route of the US 30 traces its origins to the early 1900s. Until that time, the current route was but a well-traveled wagon road parallel with the Oregon Short Line railroad. 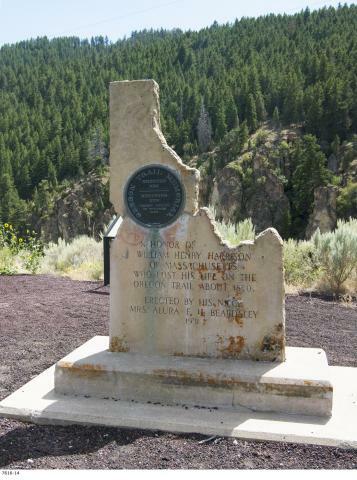 In the spring of 1903, Dr. Horation Nelson Jackson became the first person to cross the United States in a car, following portions of what is now US 30 in Idaho and Wyoming. Drl Jackson started his trek in San Francisco in a 20-horsepower Winton touring car he called "Vermont" (honoring the state in which he and his wife Bertha lived), and the final destination was Burlington, Vermont. His traveling destination was Burlington. Vermmont. His traveling companions were Sewall K. Crocker and a bulldog, Bud. 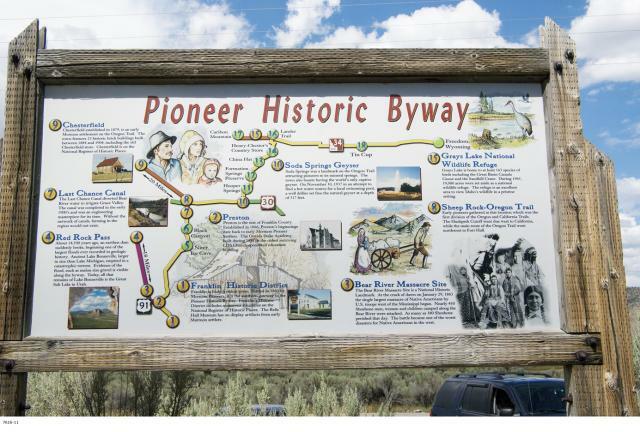 It took 63 days to complete the journey, during which the the trek merged with present-day Highway 30 near Pocatello, Idaho, and followed it into Soda Springs, Idaho, and finally into Granger, Wyoming. < Postcard from the mid-1920s of a scene near Pocatello, Idaho, before the road was officially named U.S. Highway 30. Claiming to have received 'revelations" to warn Mormon leader Brigham Young that he was "wandering from the right course." a Welshman named Joseph Morris came under rebuke in 1862 for speaking out against Mormon doctrines. 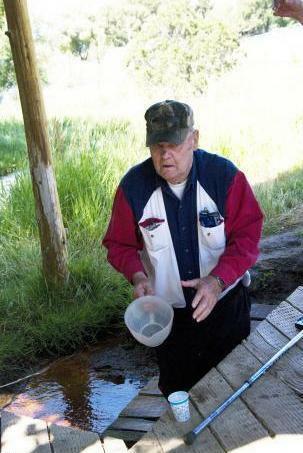 Growing hostilities prompted Morris to move to a site on Utah's Weber River where he and some 500 followers established a settlement. Still sensing animosity for their reformed beliefs, many of the Morrisites chose relocation to a new military outpost on the north bank of the Bear River. One hundred and sixty men, women and children from the Mormon dissidents founded the settlement of Morristown, in the spring of 1863. By the 1870s, the loss of military protection and support, several seasons of successive crop losses, and a series of extremly cold winters began to take its toll. 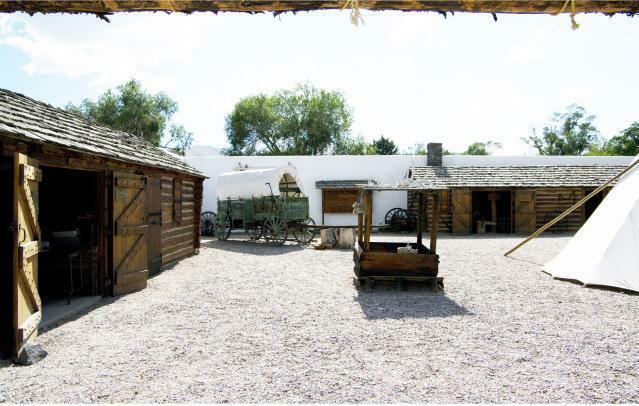 Many of the Morrisites moved away, while some were able to sell their parcels to miners and new Mormon settlers in the area. Today, most of the old settlement is under the waters of Alexander Reservoir. 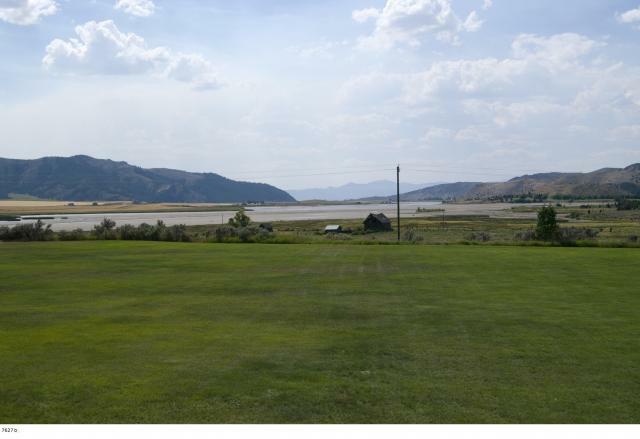 < Two hundred acres of ground was surveyed west of Soda Creek and north of Bear River for the new Morristown community. Each family allotment included a parcel of ground 25by 130 feet. The homes were one-room, dirt floor structures with mud chinking packed between the logs. Streets were laid out parallel with the river. 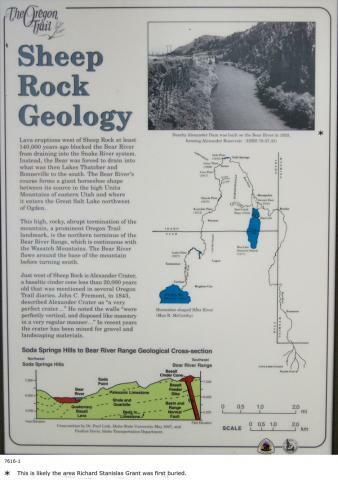 Towering 1200 feet above the waters of the Bear River is Sheep Rock, a prominent landmark described in emigrant diaries and journals as they traveled west on the Oregon and California trails. Trappers and mountain men, in the early 1830s, indicate that a sizable flock of bighorn mountain sheep occupied its forested, rocky ridge throughout the year. Modern-day maps identify this feature as Soda Point - the northern end of the Wasatch Mountain Range that towers above the Great Salt Lake Valley. 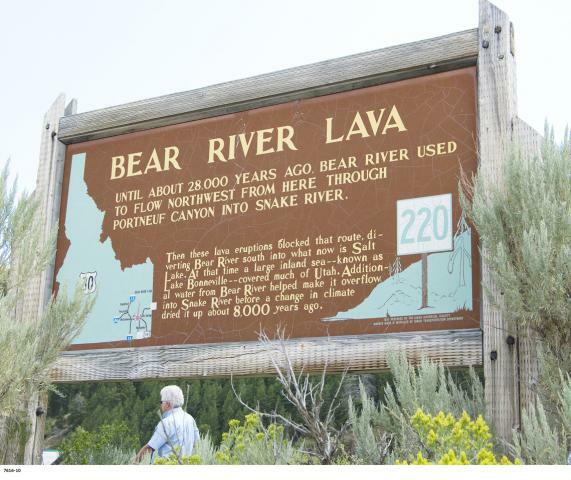 The Bear River flows north out of Utah's Uinta Mountains into southwestern Wyoming where it continues toward Soda Point and then makes a sweeping turn to the south, flowing back to Utah and into the Great Salt Lake. Its relatively level valleys provided Oregon and California bound emigrants with a good road surface as they made their way toward the Hudson's Bay Company trading post at Fort Hall. A short distance west from Soda Point the trail divides. Oregon bound wagons headed northwest to Fort Hall, and Californians turned west along the Hudspeth Cutoff toward the Humboldt River in northern Nevada. 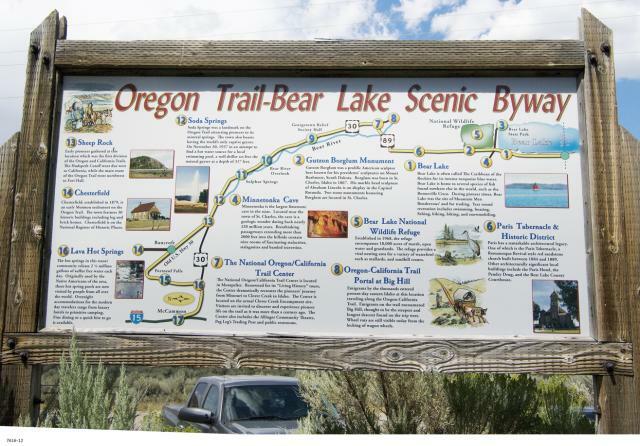 In early August 1841, thirty-nine members of the Bidwell-Bartleson wagon party followed the Bear south to the Great Salt Lake before turning west through the desert to connect with the Humboldt River. They struggled for weeks before reaching the Humboldt and were finally forced to abandon their wagons in Utah's west desert. Four months later, all 39 members - tired and starving - finally made it to California. Excitement and anxiety mounted as emigrants prepared to launch their ox-drawn prairie schooners from St. Joseph and Independence, Missouri - bustling river ports at the edge of the frontier in the 1840s. To them, the great, gray ribbon of the Missouri was the western shore of civilized society. 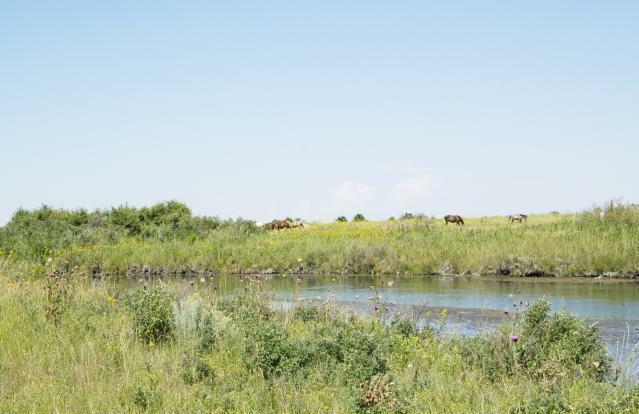 Once their wagons rolled off the ferry onto the Kansas prairie, emigrants embarked into unfamiliar country-trespassers on Indian lands and outside the protection of the government. On the trail, there were no markers, no hospitals, no laws, and no second chances. From there until they reached trail's end, some 2000 iles later, the pioneer emigrant s were on their own. Theives, murderers, problems with Indians, and starvation often plagued emigrants and overland mail carriers through the early 1860s.Numerous outcries and scathing newspaper articles from western settlements led the federal government to establish a series of military camps and fortifications that would aid and protect the hundreds of thousands of emigrants and keep the mail service on its daily course between east and west coasts. Already a popular emigrant camp, the military chose to establish some of these fortifications on a bluff above the north bank of the Bear River. Colonel Patrick E, Conner, accompanied by 300 soldiers arrived in May of 1863. 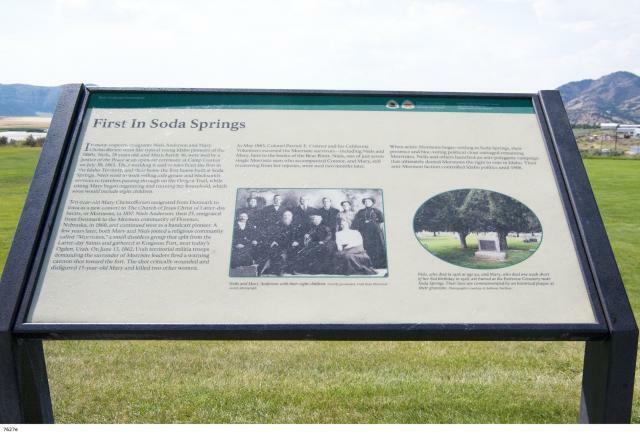 Two and a half years later, Soda Springs was able to care for itself and to provide protection and supplies for Oregon Trail emigrants as well. 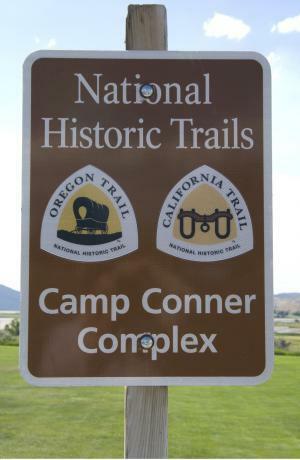 Although no physical evidence of Camp O'Conner remains today, and historians can only speculate as to its original location, many of the soldiers settled in the area after separation. Floods of emigrants, gold seekers, and Mormon settlers entering the homelands of the Shoshone and Bannock people from the mid-1840s to early 1860s gave rise to conflict and often violent encounters. Despite Mormon efforts to supply them with food, starvation loomed. Livestock from new settlements and thousands of hungry oxen and horses pulling emigrant wagons and stage coaches annually depleted grasses driving away bison and other large game---food sources that were critical to Shoshone and Bannock survival. 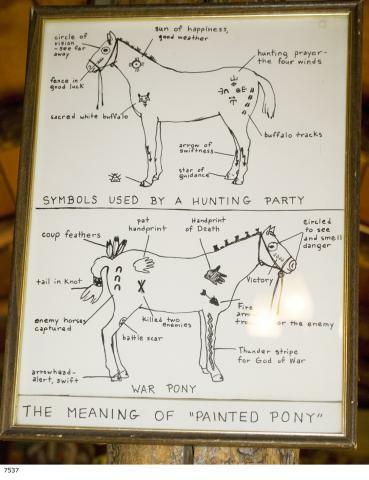 To prevent starvation--and to drive out the intruders--the Indians began raiding cattle herds and homesteads, robbing and killing miners and emigrants on the trails, and attacking coaches and stage stations, disrupting vital mail service. These events naturally led to retaliations on both sides. 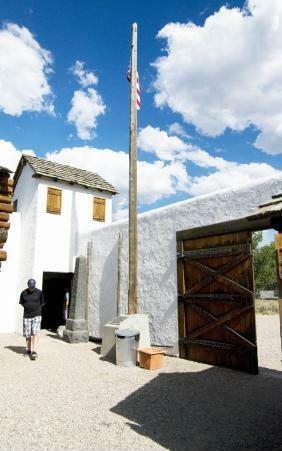 Colonel Patrick E. Connor, assigned in 1862 to protect the emigrant trails along the Bear River and the Overland maail, determined to put an end to the troubles by launching a surprise attack on Shoshone Chief Bear Hunter's winter village. 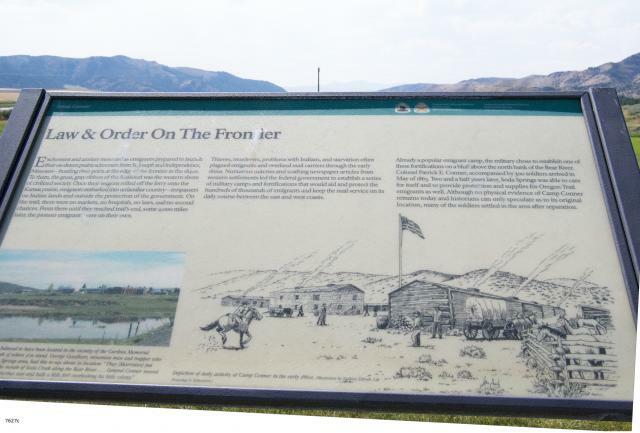 The January 1863 attack near present day Preston, Idaho, resulted in the largest single massacre of Native Americans in the west--infamously known as the Bear River Massacre. 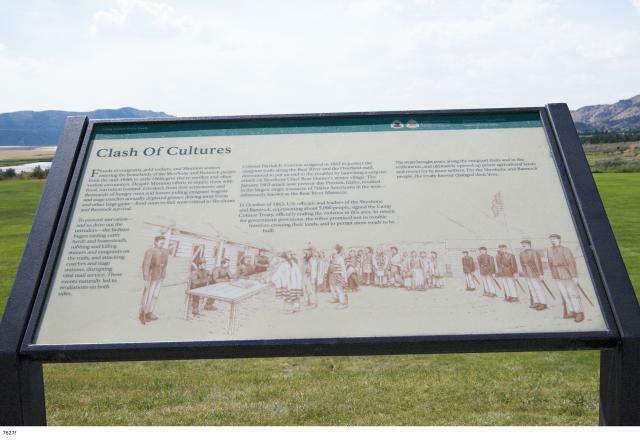 In October of 1863, U.S. officials and leaders of the Shoshone and Bannock, representing about 5,000 people, signed the Camp Connor Treaty, officially ending the violence in this area. In return for government provisions, the tribes promised not to trouble travelers crossing their lands, and to permit more roads to be built. The treaty brought peace along the emigrant trails and in the settlements, and ultimately opened up prime agricultural lands and resources to more settlers. 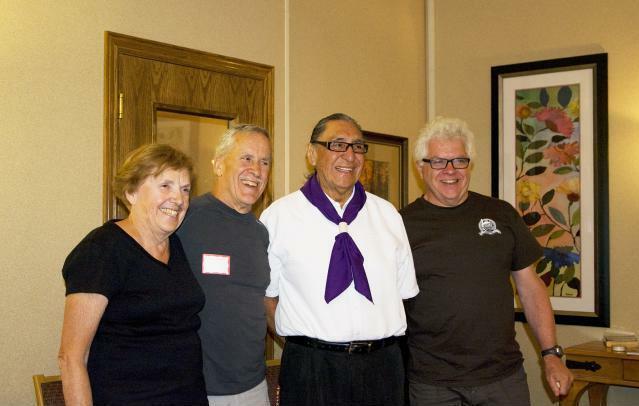 For the Shoshone and Bannock people, the treaty forever changed their lives. 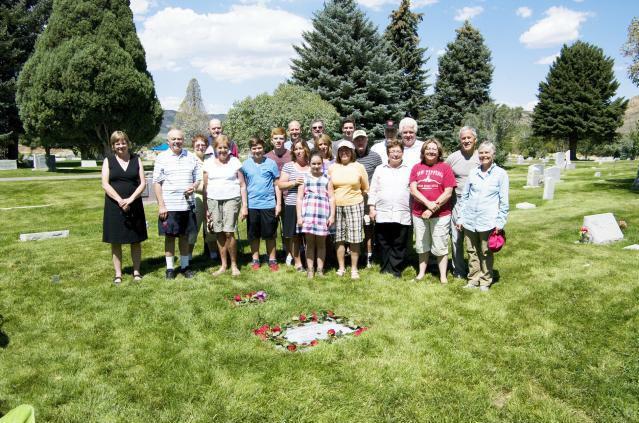 In many respects, emigrants Niels Anderson and Mary Christoffersen seem like typical young Idaho pioneers of the 1860s. Niels, 28 years old, and Mary, barely 16, were wed by Justice of the Peace at an open air ceremony at Camp Connor on July 30, 1863. Their wedding is said to have been the first in the Idaho Territory; and teir home the first huse built at Soda Springs. 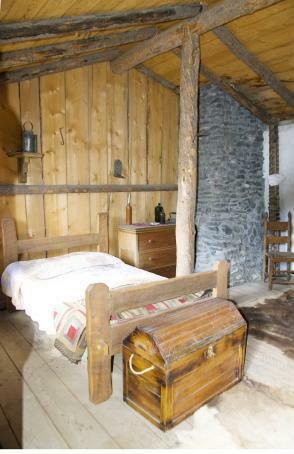 Niels went to work selling axle grease and blacksmith services to travelers passing through on the Oregon Trail, while young Mary began organizing and running her household, which soon would include eitht children. Ten year old Mary Christoffersen emigrated from Denmark to Iowa as a new convert to the Church of Jesus Christ of Latter Day Saints, or Mormons, in 1857. Niels Anderson, then 25, emigrated from Denmark to the Mormon community of Florence, Nebraska, in 1860, and continued west as a handcart pioneer. 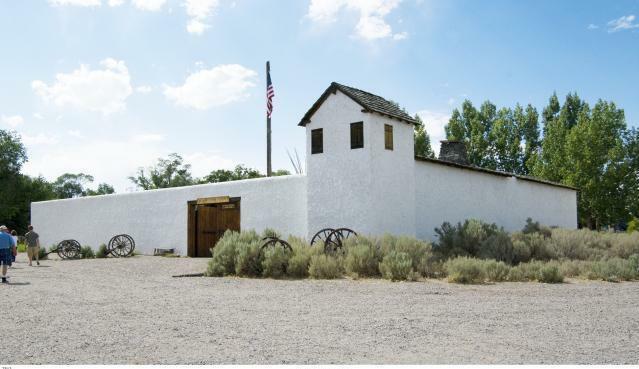 A few years later, both Mary and Niels joined a religious community called "Morrisites," a small dissident group that split from the Latter Day Saints and gathered at Kingston Fort, near today's Ogden, Utah. 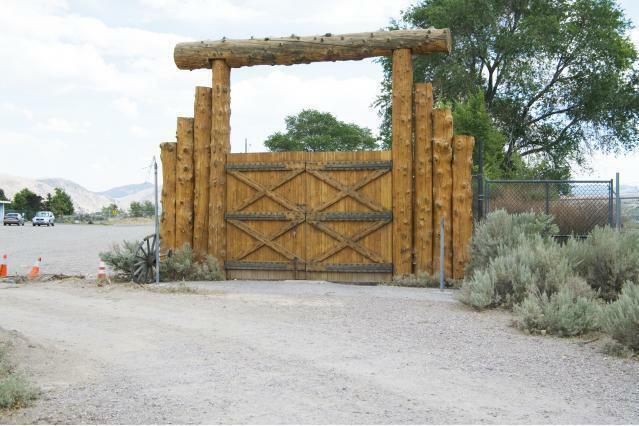 On June 13, 1862, Utah territorial militia troops demanding the surrender of Morrisite leaders fired a warning cannon shot toward the fort. The shot critically wounded and disfigured 15 year old Mary and killed two other women. 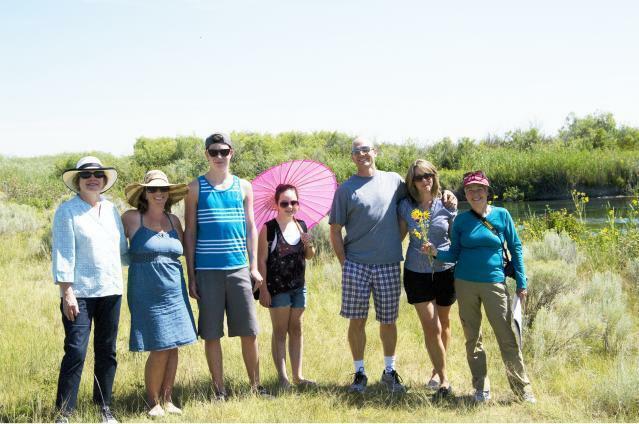 In May, 1863, Colonel Patrick E. Connor and his California Volunteers escorted the Morrisite survivors-including Niels and Mary, here to the banks of the Bear River. Niels, one of just seven single Morrisite men who accompanied Connor, and Mary, still recovering from her injuries, were wed two months later. 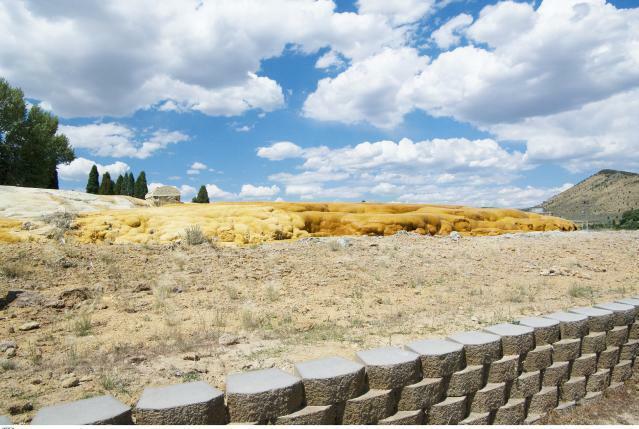 When active Mormons began settling in Soda Springs, their presence and bloc-voting political clout outraged remaining Morrisites. Neils and others launched an anti-polygamy campaign that ultimately denied Mormons the right to vote in Idaho. Their anti-Mormon fraction controlled Idaho politics until 1908. 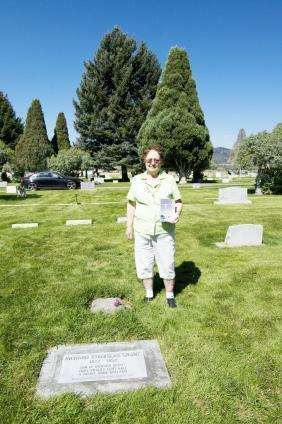 < Niels, who died in 1926 at age 90, and Mary, who died one week short of her 81st birthday in 1928, are buried at the Fairview Cemetery near Soda Springs. Their lives are commemorated by an historical plaque at their gravesite.